It is sacred to Christianity, Islam, and Judaism - faiths that collectively embrace slightly over half of the human race. It is where Christ was crucified and ascended to Heaven. It is the home of the Wailing Wall (remains of the Second Temple). It is the site of the Temple Mount where the prophet Muhammad rose to Heaven. Jerusalem's many notable holy sites include the Dome of the Rock on the Temple Mount (see photo), the Wailing Wall and the Church of the Holy Sepulcher. The old city has been preserved to retain much of its antiquated architectural character. 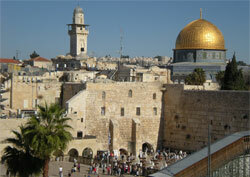 This city in Israel is grandly enclosed by high, yellowish-limestone walls pierced by eight historic gates. Each of its four tradition-named residential quarters (Armenian, Christian, Jewish and Muslim) has a twisting maze of narrow cobble-stoned streets. Jerusalem means "City of Peace" in Hebrew, but it hasn't been exactly like that during its agitated 5,000-year history. Jerusalem has seen more than its fair share of fighting - by the Roman, Byzantine and Crusader forces, to name but three. The 20th and 21st centuries have witnessed the Arab-Israeli conflicts.